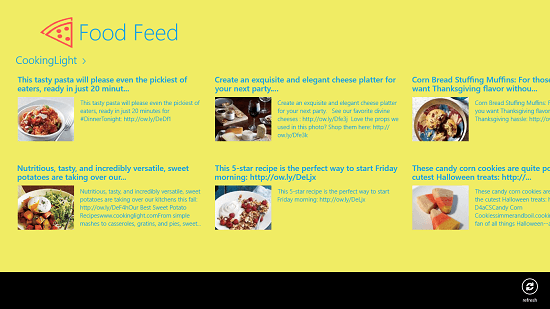 Food Feed is a free food app for Windows 8 and 8.1 which allows you to access news and recipes related to various foods on your device. When you run the app, you will be presented with an interface which allows you to see the various tiles of recipe feeds on your device. Clicking on a tile opens up a new full screen interface of the recipe accompanied by its picture and you can also choose to snap the app to one side of the screen in order to multitask. The app also allows you to follow a link to the actual source, and hence, this makes for a great way to use the app on your device! 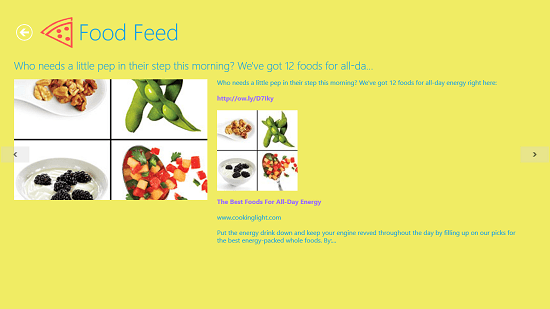 Food Feed is available for free from the Windows App Store. Be prepared to see the below interface when you launch the Food Feed app on your device. You can see that in the main screen, you will be able to see various tiles of different foods accompanied by pictures. You can click on these tiles according to your taste. When you do so, you will be taken to the full screen interface wherein you will be able to read more about the recipe or the news about the food which you have just clicked on. As the app fetches the feeds from various sources, hence it’s not just the recipes which are available in the app. You will be able to also read some news items related to foods which are upcoming. The full screen interface of the app can be seen below. In the full screen interface you can scroll vertically to read about the recipe which you have clicked on. 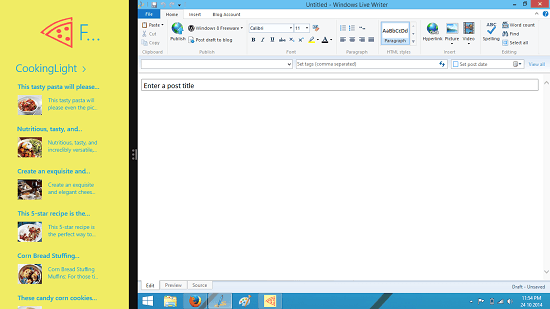 You can also click on the arrow buttons on either side of the screen to switch between various feed items. You can go back to the previous screen of the app using the back arrow button, and this makes for easy navigation. You can also snap the app to either side of the screen and it still remains fully functional. This allows for easy multitasking. In brief, this sums up the main features of the Food Feed app for Windows 8 and 8.1. Food Feed is a good app for having on your device if you want to stay updated with latest foods, and all the news related to foods on your device. The app is absolutely free, supports multitasking and as it fetches the feeds from a variety of sources, it makes for a good and accurate app with reliable data from various places!